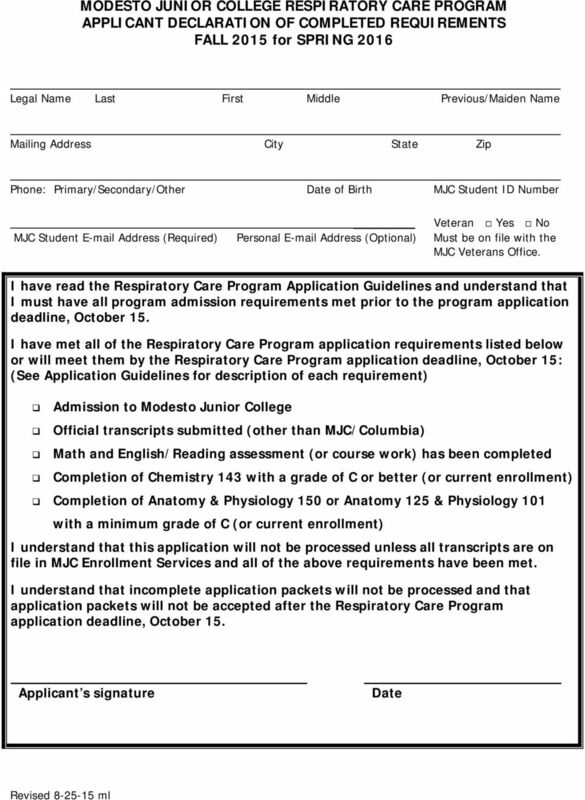 Download "MODESTO JUNIOR COLLEGE RESPIRATORY CARE PROGRAM APPLICATION GUIDELINES. 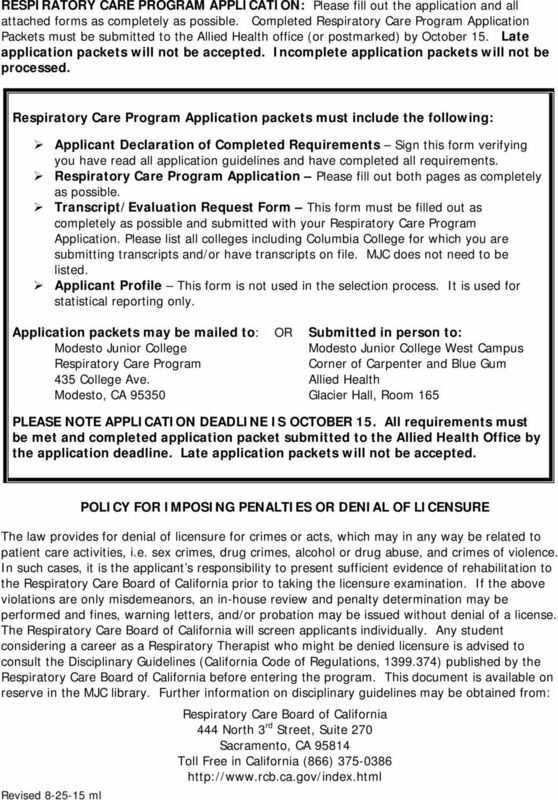 Fall 2015 Application Period for Spring 2016"
1 MODESTO JUNIOR COLLEGE RESPIRATORY CARE PROGRAM APPLICATION GUIDELINES Fall 2015 Application Period for Spring 2016 Please read all application guidelines carefully. It is the applicant s responsibility to read all guidelines carefully and make sure that all requirements have been met prior to the Program application deadline. 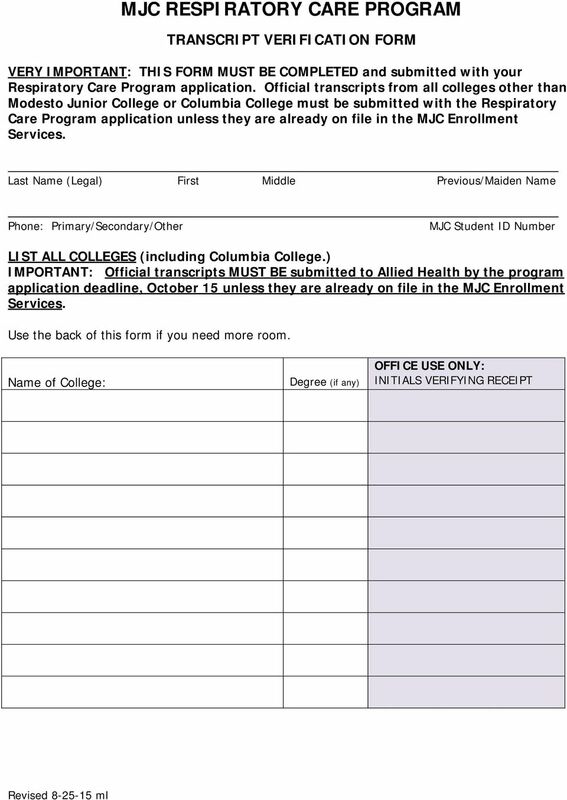 If any of these requirements have not been met, your application packet will not be processed and you will be found ineligible for the program. 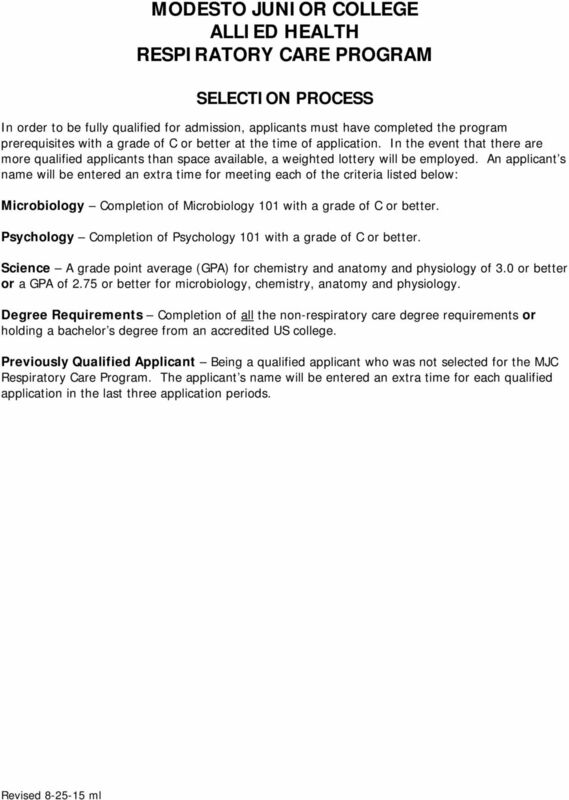 If you have any questions regarding the application guidelines call Allied Health at or us at Admission to Modesto Junior College (MJC): If you are not currently a MJC student, you must apply for admission to MJC. You can apply for admission at or in person at MJC Enrollment Services on either campus. High school graduation or equivalent (GED or college degree): High school graduation or equivalent is highly recommended, but not required. Official College transcripts: If you have attended college(s) other than Modesto Junior College or Columbia College, official college transcripts must be submitted with your program application by the October 15 application deadline unless your transcripts are already on file in the MJC Enrollment Services, East Campus, Student Services building 102, You should have someone from Allied Health or Enrollment Services initial the Transcript Verification Form included in your application packet to verify that your transcripts are already on file or to verify receipt of your official transcripts. Only official transcripts submitted by the application deadline will be used to determine program eligibility. It is the applicant s responsibility to ensure that all transcripts are on file and up-todate. 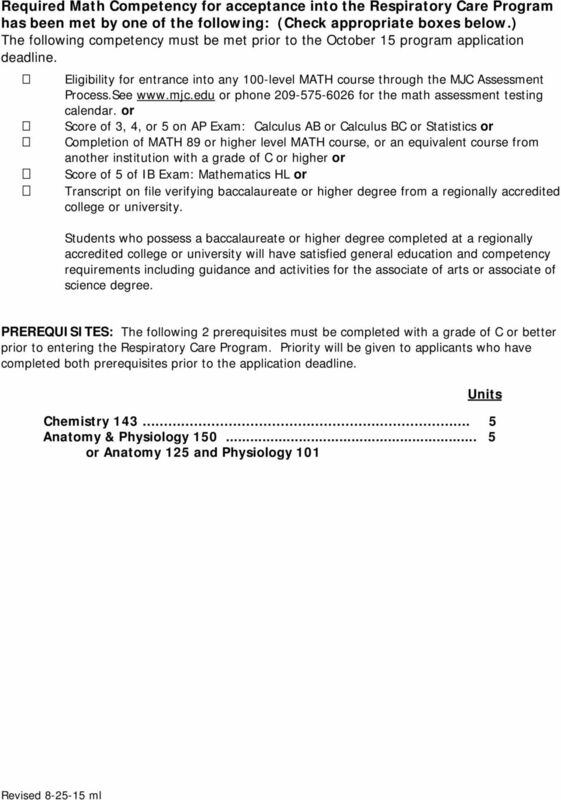 NOTE: Students submitting transcripts from colleges out of district or from any college prior to 1995 must provide course descriptions on coursework required for the respiratory care program including math, English and sciences. A copy of the cover of the catalog for the year the course was taken must be included along with the course description from that catalog. 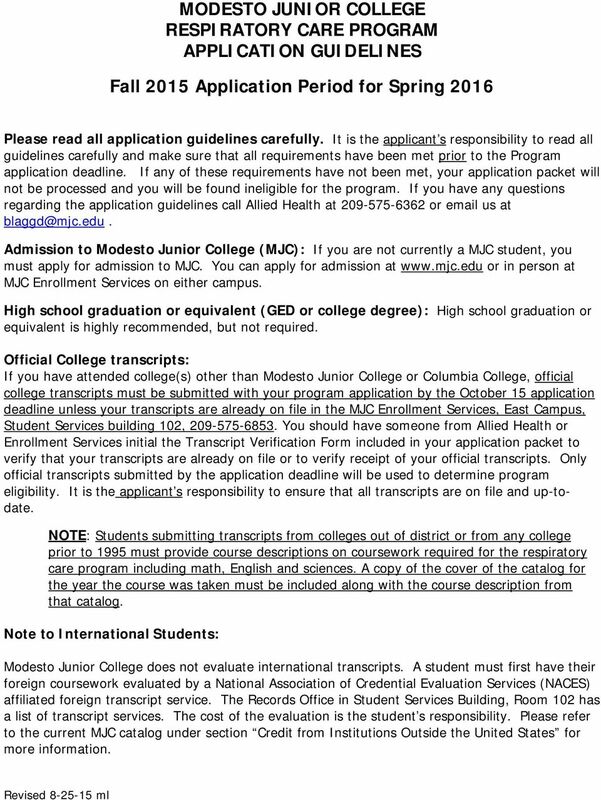 Note to International Students: Modesto Junior College does not evaluate international transcripts. A student must first have their foreign coursework evaluated by a National Association of Credential Evaluation Services (NACES) affiliated foreign transcript service. The Records Office in Student Services Building, Room 102 has a list of transcript services. The cost of the evaluation is the student s responsibility. Please refer to the current MJC catalog under section Credit from Institutions Outside the United States for more information. 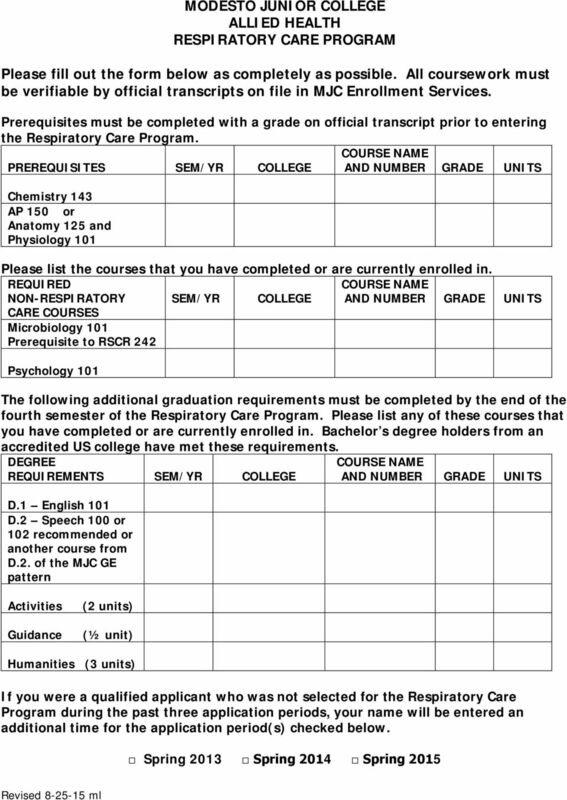 4 PRIOR TO ENROLLING IN THE PROGRAM IMPORTANT: Students are strongly advised to complete the following required courses and the additional graduation requirements prior to entering the respiratory care program. These courses must be completed by the last semester of the program with a grade of C or better in order to complete the Respiratory Care Program and be eligible to take the State Board Respiratory Care Practitioner exam. 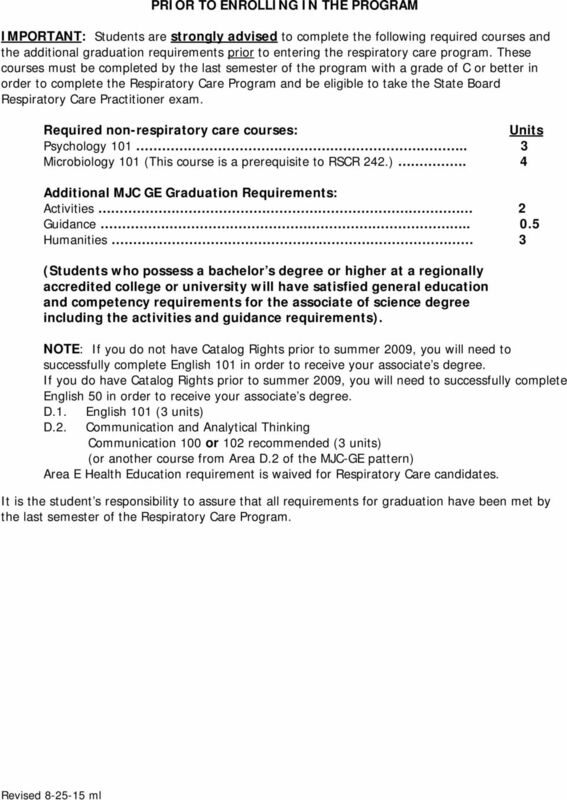 Required non-respiratory care courses: Units Psychology Microbiology 101 (This course is a prerequisite to RSCR 242.). 4 Additional MJC GE Graduation Requirements: Activities 2 Guidance Humanities 3 (Students who possess a bachelor s degree or higher at a regionally accredited college or university will have satisfied general education and competency requirements for the associate of science degree including the activities and guidance requirements). NOTE: If you do not have Catalog Rights prior to summer 2009, you will need to successfully complete English 101 in order to receive your associate s degree. If you do have Catalog Rights prior to summer 2009, you will need to successfully complete English 50 in order to receive your associate s degree. D.1. English 101 (3 units) D.2. 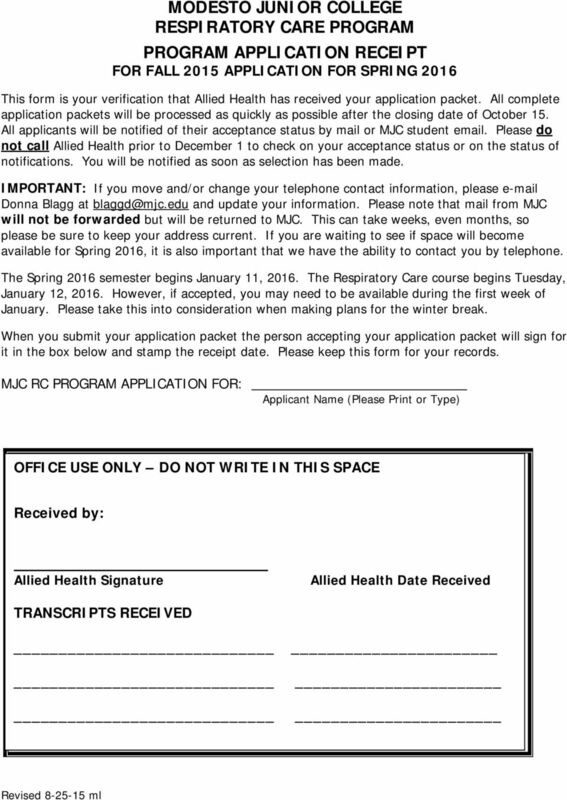 Communication and Analytical Thinking Communication 100 or 102 recommended (3 units) (or another course from Area D.2 of the MJC-GE pattern) Area E Health Education requirement is waived for Respiratory Care candidates. It is the student s responsibility to assure that all requirements for graduation have been met by the last semester of the Respiratory Care Program. 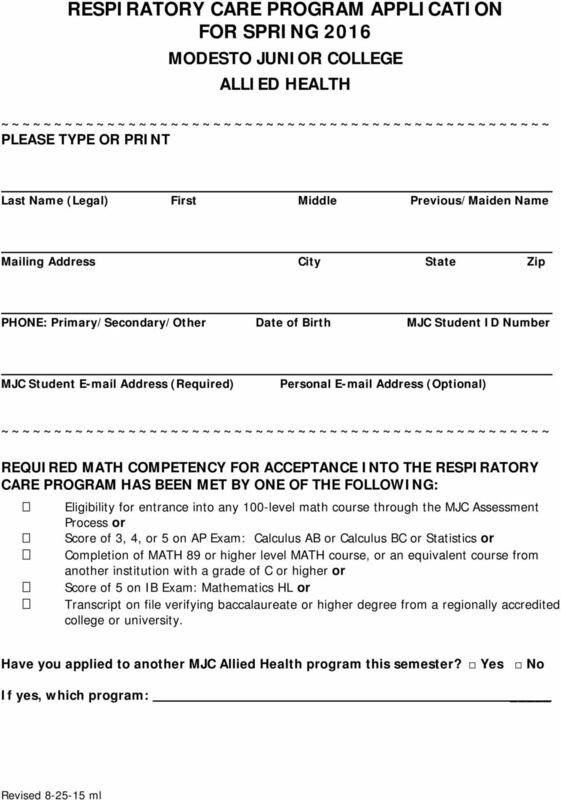 5 MODESTO JUNIOR COLLEGE ALLIED HEALTH RESPIRATORY CARE PROGRAM SELECTION PROCESS In order to be fully qualified for admission, applicants must have completed the program prerequisites with a grade of C or better at the time of application. In the event that there are more qualified applicants than space available, a weighted lottery will be employed. An applicant s name will be entered an extra time for meeting each of the criteria listed below: Microbiology Completion of Microbiology 101 with a grade of C or better. Psychology Completion of Psychology 101 with a grade of C or better. Science A grade point average (GPA) for chemistry and anatomy and physiology of 3.0 or better or a GPA of 2.75 or better for microbiology, chemistry, anatomy and physiology. Degree Requirements Completion of all the non-respiratory care degree requirements or holding a bachelor s degree from an accredited US college. Previously Qualified Applicant Being a qualified applicant who was not selected for the MJC Respiratory Care Program. The applicant s name will be entered an extra time for each qualified application in the last three application periods. Attach a copy of your current California LVN license with this application. Several starting dates per year: The ASN degree program admits students three quarters out of the academic year: Fall, Winter and Spring. SAMPLE. master of nursing program. 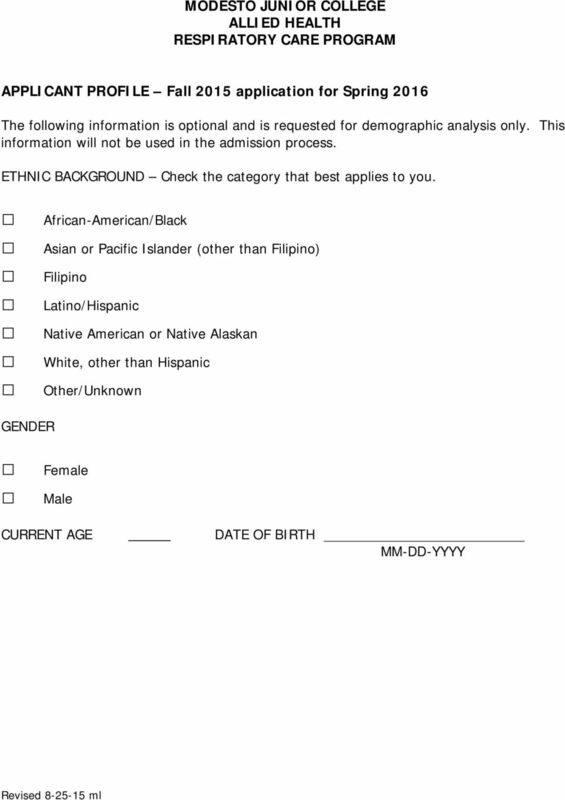 (for pre-licensure applicants only) 2008 Application. explore, engage, excel!